Law enforcement is taking another look at nunchucks, which were in wide use by police in the 1980s. The Anderson Police Department in rural Northern California has added nunchucks, also called nunchucku, to its arsenal of non-lethal weapons. The Anderson Police Department in rural Northern California has added nunchucks, also called nunchucku, to its arsenal of non-lethal weapons. 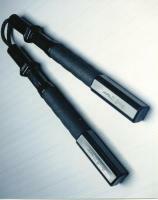 Nunchucks offer the power of traditional nightsticks, and are easier to carry. In addition, they enable trained officers to speedily bind wrists and/or ankles; they can help control a suspect without violence. The 20 officers in Anderson will have the option to replace their batons with a tool that first gained notoriety in the Bruce Lee movies from the 1970s. The Anderson police acquired the Orcutt Police Nunchaku (OPN) from Denver-based Orcutt Police Defensive Systems, Inc. (OPDS). The model feature two sticks of flexible polycarbonate connected by a foot-long nylon flexible cord. There’s a photo of the product to the right. Kevin Orcutt, the owner of OPDS, sells his firm’s product to law enforcement, corrections and the military. He provides three days of training and certifies officers as instructors to teach others in their agencies how to use the OPN. Orcutt’s background includes 36 years in law enforcement; he retired from his last police job in March. In years past, the OPN was quite popular with police in the Golden State. There were no officers injured as a result of implementing the OPN in Calif. Sales of OPNs, however, dropped once departments began buying Taser electrical weapons in the late 1990s and early 2000s. Orcutt believes law enforcement is ready to reconsider his firm’s product as a tool for 2016. “It has a real place in corrections. It has a place in law enforcement for active areas—where’s there’s a lot of stuff going on.” He adds that deploying the OPN requires that officers continue their training to maintain skills in using the tool.“It’s an effective tool if the training protocols are followed,” Orcutt adds. The Denver sheriff’s has deployed the OPN tool since 1991. The photo to the left shows how the OPN is applied. The OPN is suited for an era when everyone makes videos of police encounters, Orcutt adds. “The OPN permits much softer and low-profile control and physical restraint applications for officers.” He adds that the device reduces the time needed to restrain a suspect. In the video, Kevin Orcutt demonstrates how the OPN, a non-lethal controlling device, can help apprehend a suspect.